SanFrancisco’s attempt to incorporate community input into the police reform effort could be viewed as delusional (police would never take advice from civilians) to foolhardy (the two would never get along). Nevertheless, that is what the SFPD and civilian stakeholders have attempted to do as they work through the Justice Department’s 272 recommendations to make the SFPD better. Nearly half of those recommendations have found solutions — at least on paper. To gauge the success of community input, Mission Local surveyed dozens of residents who have participated — and are likely to continue to participate — in the process. The oversight of the working groups is even more critical now because the Department of Justice pulled out of this role in the fall, and although Police Chief Bill Scott has promised to replace it with another independent review group, that group has yet to be announced. Many said they remain skeptical, and would like to see stronger mechanisms for incorporating their input. For now, the residents — who generally represent stakeholders such as the Bar Association, neighborhood activists and criminal-justice professionals — will remain on the committees that are far from finished with the work. That prospect is what drew Camarena, an attorney from Mexico and a community activist in the Mission District, to sit on the Working Group for Community Policing, one of the five areas the Justice Department’s recommendations fall under. The others include bias, accountability, use of force, and recruitment, hiring, and personnel practices. Each is led by a command-level officer — the Executive Sponsor — and some include Police Commissioners. “Community engagement is about changing the way policies are made,” Camarena added, pointing out that some officers conflate it with community relations. Community engagement is not, Camarena says, coffee with a cop. Instead, she and others see it as a process where police take into account civilian recommendations. While the Community Policing working group, led by Commander David Lazar, has been praised for facilitating the most dynamic and involved participation, the two-way exchange between officers and the community was supposed to be present in each working group. But numerous people who have spoken to Mission Local expressed dissatisfaction and frustration with how the group leaders have integrated their input. They described an opaque, and — at best — confusing process that mostly keeps community participants at the periphery of developing new policies. The use-of-force working group, headed by Commander Peter Walsh, faced the most challenges, according to those who spoke to Mission Local. Stakeholders who would not speak on the record said that they have repeatedly asked Walsh to invite representatives of the ACLU or the Blue Ribbon Panel, a panel sponsored by the District Attorney that was largely ignored by the SFPD. These suggestions have faced resistance, they said. Nevertheless, many believe there is a sincere desire among the police officers who have taken leadership roles in the working groups to involve the community — they just lack a real infrastructure to do so. “I never felt ignored, but what I did suspect was there was no mechanism for taking the feedback and incorporating it into the process,” said John Talbot, a member of the bias and accountability working groups. Measuringcommunity involvement is tricky. While members of the police department may feel like they are putting in a valiant effort — putting in extra hours to attend meetings late into the night, patiently listening to citizens’ concerns and explaining the intricacies of their work — it still falls short for those who expect to have a voice in how they, and their neighbors, are policed. Traditionally, police reform has not included the community, and experts on police reform say that getting through the resistance to community involvement is the next frontier. Whether San Francisco gets there is yet to be seen. Barry Friedman, the director of New York University’s Policing Project, works with cities around the country to make police departments’ practices more transparent and accountable to the community. “Democracy works this way around everything except policing,” Friedman said. The Five Working Groups and commanders in charge. The five working groups and the progress of the recommendations. 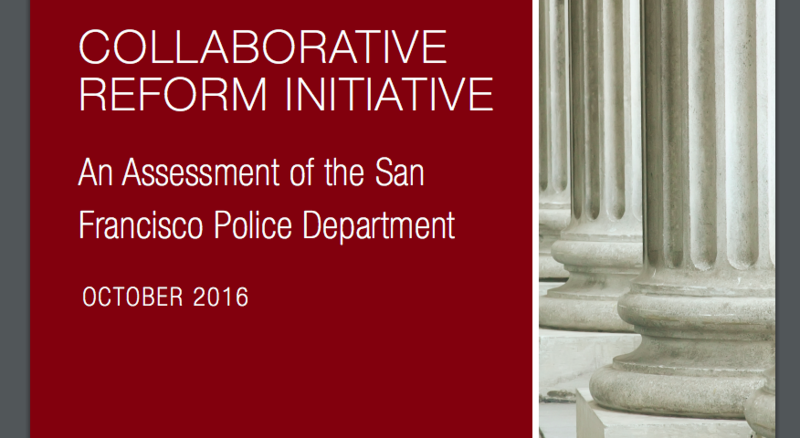 SanFrancisco has already had civilian oversight through its Police Commission. But it is trying to expand that infrastructure, in which citizens can influence how the department works through the working groups. Deputy Chief Michael Connolly, who heads the Professional Standards and Principled Policing Bureau, the organizational umbrella for the working groups, said that the SFPD is committed to making this collaborative process an ongoing one — not one that will end once the DOJ’s 272 recommendations are addressed. Lieutenant Yulanda Williams, who did the initial groundwork of casting a wide net of invitations to community members of all perspectives to attend the working groups, also says that the department has tried to be responsive to criticism. “It was never the direct intent to not listen to people,” Williams says, adding that Commander Lazar and other officers have tried to make changes to address concerns. The difficulty of this process — and frustrations inherent to it — was on display at the Taser working group’s first meeting after the Police Commission approved the weapons in early November. The group had convened to review the latest draft of the SFPD’s Taser policy before it was passed on to the Police Commission. Many in attendance felt like the policy failed to reflect their concerns. “We made critiques, and all they did was make it worse,” said Tom Meyer with the San Francisco Bar Association. Among his concerns was that the policy had relaxed language around limiting the use of Tasers on vulnerable people, such as pregnant women and children. In a previous draft, the police had prohibited the use of Tasers on these groups unless deadly force would be permitted. The latest version only said “special consideration shall be made” in those circumstances. Two days later, at the Working Group for Accountability meeting, there was confusion about when community members could be part of the process. After Sergeant Gary Buckner finished presenting his solution to a recommendation that the SFPD find a way to better maintain its general orders — so that orders would not remain untouched for more than 20 years ­­– Barbara Attard raised her hand. “I’m unclear what is supposed to be happening at these meetings,” she said. Deputy Chief Mikail Ali, who was newly appointed to head the accountability working group, explained that developing policy takes place outside of the Executive Sponsor meetings. Buckner had worked with a subgroup to develop the recommendation. “These meetings are only for presenting the work that takes place elsewhere,” Ali said. Attard has worked in police oversight for over three decades and says she has not known how to get involved at the policy-creation level. Buckner said he had invited people to be involved in a sub-group to develop policy, but Attard said she never got an invitation. “I put my name in, but it wasn’t clear to me how this process would work,” she said after the meeting. She didn’t have objections to Buckner’s presentation, but she didn’t just want to be a sounding board. Members from the use-of-force working group echoed Attard’s frustration. They said that they are only able to ask questions and make suggestions on the policies presented to them, but there is no way for them to see if their input has an impact. Commander Walsh said that he was not aware that stakeholders feel there is a lack of transparency in the group. “I do not believe we have rejected a community member’s idea outright,” he wrote in an email to Mission Local. “If members have recommendations or opinions, the Department weighs them to see if they are practical and/or adaptable,” Walsh wrote. Forall working groups, policy recommendations are created outside the meetings — either in a subgroup, or by an SFPD project manager. Those policies are then presented to community members for discussion and feedback. What happens next is less clear. Karen Fleshman, who has been involved in grassroots police accountability groups like San Franciscans for Police Accountability and Justice 4 Mario Woods, sits on the Working Group on Bias. She says she feels like the police department has taken the community’s input into consideration while they draft their policies. Camarena said that even the Community Engagement working group has failed to harness their more robust participation into policy formation. But Lazar said that he implements the “overwhelming majority” of what the community recommends. An example of this disconnect, Camarena said, was the increase of foot patrols across the city — quadrupling them in Mission District and doubling them in the Bayview. Police Chief Bill Scott announced the increase at the end of August, before the working group took up the DOJ recommendation that the SFPD evaluate whether implementation of foot and bicycle patrols would improve trust between the department and community. Though she does not inherently object to increased foot patrols, Camarena has serious concerns that, without thoughtful attention to underlying issues like bias, accountability and use of force, simply increasing foot patrols is not necessarily a good thing. Lazar said increasing foot patrol is not controversial and, since foot patrols were already part of SFPD, implementing them was not a matter of policy change. “We look forward to hearing their conversation about foot patrol, but in the meantime, we’re rolling it out,” Lazar said. Despite these complaints, Camarena gives Commander Lazar credit for being more responsive to change. After receiving feedback, he now writes down community recommendations and clearly communicates back to the group what policy recommendation he is making to the Chief of Police — even if they don’t reflect the community’s input. “I want more transparency. SFPD is not used to transparency,” Camarena says.